This Indian boy performed surgery at seven years old. His name is Akrit Jaswal. 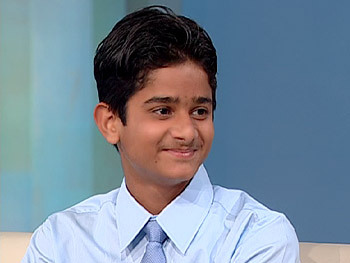 Now 13 years old he has an IQ of 146, one of the smartest people in the world. His first siurgery was separting a girl’s fingers which were fused together as a result of being badly burned. The surgery made headlines around the world. At an age when most children are learning their ABCs, Akrit was reading Shakespeare and assembling a library of medical textbooks. When he was 5 years old, he enrolled in school. One year later, Akrit was teaching English and math classes.Akrit developed a passion for science and anatomy at an early age. Doctors at local hospitals took notice and started allowing him to observe surgeries when he was 6 years old. Inspired by what he saw, Akrit read everything he could on the topic. When an impoverished family heard about his amazing abilities, they asked if he would operate on their daughter for free. Her surgery was a success. This entry was posted in Askrit, Jaswal, sevenyearsold, surgeon. ← Who is trying to confuse consumers here? What the heck is going on? There should be a code in the medical profession. Isn’t it there in India. The little guy is smart but he is not certified to do surgeries on people. Does Medical Licnce mean anything ? This will only abet the malpractice on poor people. wat?! is this real or just some joke?! i mean y isnt the guy world famous and rich?! i’ve never heard of him b4. can’t you just be happy for that young genius? just to think he helped an impoverished family. they were glad for his help. Looks like I wasted my life going through med school then. Wow, that’s extreme. I wish I was as smart as him. Why oh why do so many pessimists just have to see the negative? This is absolutely wonderful & I heartily approve – I hope this ‘genius’ continues his good work. When aeroplanes were first built there was no such thing as a pilot license (spelling Asmat!) but that didn’t stop wonderful pioneers from flying !!!!! Akrit Jaswal: I just saw a recap of the surgery you performed on Oprah’s show. You are amazing.. a gift from God to mankind. I understand you’re 17 now and working on your Masters’ Degree in Chemistry and that your life dream is to invent a cure for cancer. I believe you have the passion and all it takes to achieve your dream. He is listed on DOCTORIN.com as a top doctor. In addition he is starting a company set to compete with Autotrader. It’s ATrader.com. What a genius he is!